No one wants to think about the possibility of a beloved dog running out into the street, yet a study shows that more than a million dogs were struck by cars last year in the U.S. alone. These tragic accidents happen all too often to dogs, both on-leash and off, in a matter of seconds. Fenced in yards are safest, but make sure doors and gates are securely closed to keep your dog from wandering into the street. Remember to advise anyone who might need access to your yard such as telephone or cable repairmen, landscapers, or deliverymen. A sign on the fence can serve to remind them as well. During the winter, remember to shovel any snow that may pile up near your fence. 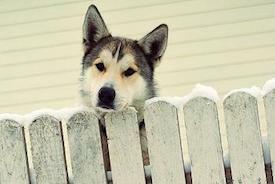 Many dogs are able to hop fences from climbing onto snow piles. When visitors arrive, or children answer the door, teach them about your dog’s habits and make entering or exiting your home an escape-proof event. When you and your dog are traveling in a car, don’t lower the car window. Pets get distracted and often jump from cars, unaware of the speed or dangers. When you stop for gas and get out of your car, make sure to close the car door behind you. Long, retractable leashes are great for the park, but if near the street, it can be difficult to reel your dog in quickly if he runs into the street. Be sure you have full control of the area he has access to. Always have your dog on a leash in places that are new or strange to him. Reflective collars can save a life if your dog runs into the street at night. Consider having your pet micro-chipped. If your pet is hurt and taken to a veterinary hospital, this will help to have him returned to you. Everyone is looking forward to a beautiful Spring but, unfortunately, this is when the frequency of this type of accident occurs. We want your dogs to be safe and sincerely hope this knowledge helps you to prevent any future accidents.